In agent-based pedestrian circulation models, the simulation of the pedestrian-environment interaction is mostly achieved by imposing on each agent a predefined list of goal locations which the agent visits in turn. However, in reality human behaviour in complex environments is highly dynamic and fixed plans are often changed and adjusted according to emergent conditions and the person’s individual interpretation of these events, in particular the amount of time available to achieve all the desired tasks. 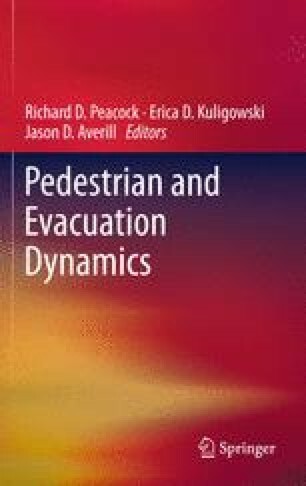 In this paper we present a prototype emotion model implemented within the buildingEXODUS evacuation and pedestrian dynamics software which enables simulated agents to react to perceived time pressures by modifying their behaviour. The model is demonstrated using a circulation scenario within a rail terminal.